Top: Preliminary campus framework of open spaces, connectors, and permissible building sites. 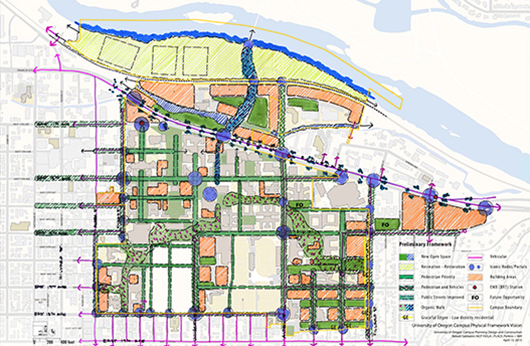 The University of Oregon Campus Physical Framework Vision (UOCPFV) presents a comprehensive physical structure of the campus. It is a resource to the university’s Campus Plan. It provides greater specificity to inform decisions to accommodate growth and change, and to ensure the enhancement of the campus’s beauty, legacy, and functionality. The university undertook this study in recognition that their Campus Plan lacked direction in areas where the campus has grown over the last few decades. The UOCPFV provides greater specificity of open spaces and buildings to better inform decisions on how to accommodate growth and change, and preserve the beauty and functionality of the campus. A geographic information-based on-line survey prepared with the university identified patterns of use such as places to study, eat, socialize as well as modes of circulation. In addition, university staff prepared numerous diagrams of the current campus systems including open space, circulation, and access.